You cannot have a ruffled bedskirt make of this quality and fullness at the price offered. Also the fabric which the skirt is sewn to is not flimsy and resists ripping while you are trying to put the bedskirt of the bed. Add a clean and classic look to your bedroom decor with this white ruffled bedskirt from Laura Ashley. 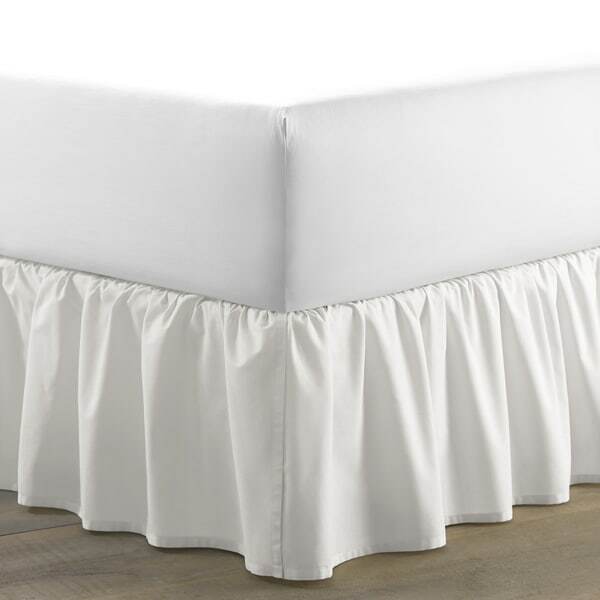 The delicate, white cotton bedskirt features a row of soft, full ruffles with a split corner construction that makes it easy to fit the pretty skirt onto your bedframe. Machine washable with a 15-inch drop, this bedskirt will make a simple but lovely addition to your bedroom. I received the Laura Ashley 15-inch ruffled bed skirt today. It is absolutely beautiful. You can tell the material is of high quality by the feel of it. It is a beautiful shade of white. What I mean by that is a crisp white but has such a homey feel to it also. I plan to buy several more for all my beds. You cannot go wrong by purchasing it. The center of the dust ruffle was not really cloth. It was some kind of paper or plastic That melted when I ironed it. Also the ruffle itself was shorter than the description.Laura Ashly would not be happy that her name was used with this item. I needed a 14" bed skirt, this one is 15". It is perfect for my bed. The fabric is a nice weight, not gauzy or overly heavy. Has a nice drape. I like the split corners and that it covers the entire box spring. The part that lay on top of the box spring is a paper type material and when ironing the fabric of the ruffle, just the steam from the iron melted it a bit. Be carefull ironing it. They used to make that part out of muslin but I guess everyone is cutting corners these days. If it does tear away from the ruffle, I can sew a muslin replacement on it. Unfortunately, not everyone can do that. All in all, I'm happy with the bed skirt though. It won't get dirty since I live alone and my dog doesn't crawl under the bed past the bed skirt so I won't be laundering it very often. It might not last long if it needs to be laundered often only due to the paper box spring cover. The skirt if full enough but the fabric is a little thinner than I would have liked, and the fabric that the skirt is sewn to is very thin. Another reviewer warned that it could rip easily, so I was careful to tug it gently when adjusting underneath the king mattress. I kept it because I couldn't find a plain white bedskirt of this length without spending a fortune. I equate Laura Ashley with a higher quality product. But, I would buy it again for another room if I need a white bedskirt because it does what it's supposed to do.. I purchased this dust ruffle to go with the intelligent Design Lily coverlet set. The crisp white color works great with the coverlet and makes the colors pop. I purchased the full size and it is the perfect length for the bed. First off i am so glad i didn't listen to the review below. I used starch and this bed skirt was easy to iron. It took about 25 min. I have a king bed where the box springs are not twin long. I needed something that would be a bit forgiving with how it hung because my box springs are staggered, until i can get the long box springs. I looked carefully at how all the bedskirts hung and this one just looked the best. This will go with work in with lots of other bedding just a good timeless bedskirt. I rated it a 4 because i thought the material could have been a bit more heavy, its not bad though. Lightweight bed ruffle for full size bed frame set in child’s bedroom. The bed skirt did not hold up well and tore at the seam after little use. Perfect product. Nice thick fabric for a quality look. Fits perfectly on my antique iron bed. Not much to it and not really large enough for queen bed. Just seeing this bedskirt I would recommend it. It was a nice, bright white. It was exactly what I wanted and arrived in time and in good condition. But when it arrived, I realized I had the wrong size, and had to return it. My return experience was very easy. I thought it was one that you put around the mattress but it had to go under the top mattress. Great bedskirt. It is a bit stiff even after washing but should hold up well for many washes. "What is the drop length? Cannot believe it is not in description." "Can this be machine dried?" I dried it on low. No. The piece that goes under the mattress is like tissue paper and it melts in the dryer. I ruined both of mine. "Does this cover all 4 sides of the bed or just 3?" "Do you sell Super King size bed skirts?" Cal King is not available. We apologize for any inconvenience we might have caused. Simple white cotton bedskirt with split corners is what I looked for and these seem to fit that need. I needed a neutral bed skirt for my daughter's bed. This is perfect for my bed. It compliments the white bed I am trying to create. It's very nice looking and not too much since I have to take into consideration my husband, not to have so many ruffles making it really girly looking. This bed skirt is not girly, its just enough for style and cover up the bottom of the bed that shows when I make up the bed. "Is his bed skirt fitted?" Hello Karen Baumgart, yes, this bed skirt is fitted. Thank you for shopping with us!